- 100 to 150mm long steel blade with straight edges. Specifications : Weight approximately 210 gm. Best quality with hardwood handle Blade length approx.200 mm. We are offering Masonry Trowels to our clients. We Manufacturer, Exporter & Supplier of Gauging Trowel. We manufacturer Gauging Trowel in different sizes and shape. The gauging trowel is a versatile tool used for transferring plaster (the broad rounded point is ideal for picking plaster out of a bucket) and for applying plaster to a wall or surface. 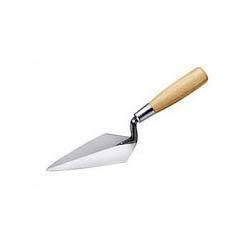 Use this trowel for mixing or "gauging" small quantities of plaster. We are also engaged in offering an assortment of Karni Kotla Cut Shape that are fabricated by using high grade raw material and are widely used for smoothing surface. Our range is acknowledged for their durability, quality and efficiency. - Made out of 20cm long blade with wooden handle weighing 210 gms. ShreeJi Carbon Steel Trowel Gauging Trowel, Size/Dimension: 12" and 18"
The gauging trowel is a versatile tool used for transferring plaster (the broad rounded point is ideal for picking plaster out of a bucket) and for applying plaster to a wall or surface. 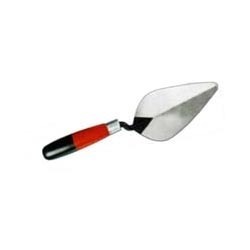 Being a prominent name of the industry, we are engaged in trading, supplying and wholesaling a durable range of Gauging Trowel to our esteemed patrons. We are among the industry veterans, engaged in manufacturing, exporting, and wholesaling Gauging Trowels. Straight edge for producing a radius at the edge of a concrete slab to prevent chipping. Stainless Steel Blade with wooden handle . Our in-depth knowledge and industrial expertise enable us to manufacture a distinguished range of Finishing Trowel.